Cucumber Salsa makes the storms go away. As the day rolled on, al l I could think about was the horrible storms that hit the night before and the line of them that were coming straight towards our state again tonight. I arrived home, and decided that I needed to do something to get my mind off of the storms that I’m deathly afraid of. So, I cooked a meal that took a bit longer than 30 minutes; while I diced away at the vegetables the sound on the television telling people in the surrounding areas to take cover and the loud thunder outside slowly faded away. Tip for the day: Read a recipe all the way through before cooking it. I made this mistake today while cooking Lemon Chicken. The recipe called for a marinade and part of the mari nade would be used for the chicken and part of it was to be reserved to use later on in the recipe. I didn’t realize that I was supposed to save part of it until I had already poured all of it into the bag with the chicken. I’ve done this many times before, so it is a tip that needs to be practiced – not just stored in your brain. 1. Allow chicken to defrost and rinse off. 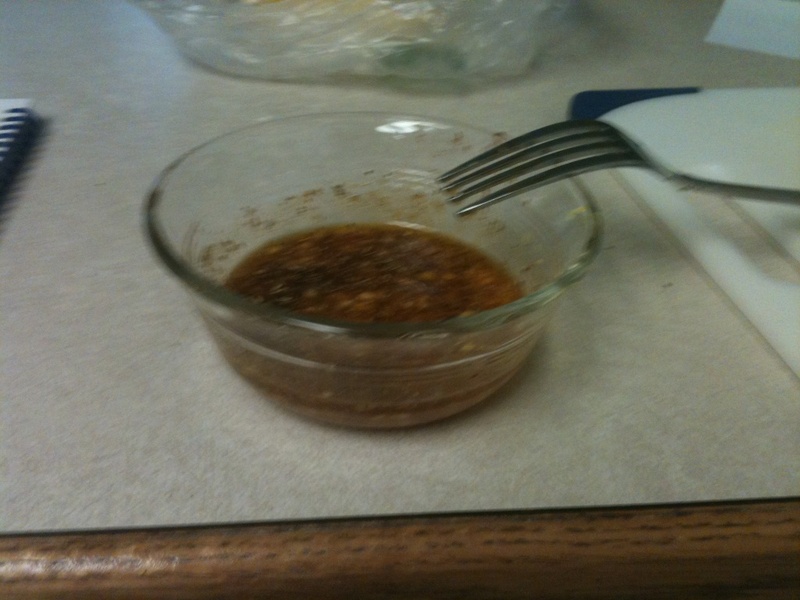 Prepare the marinade in a small bowl. Add lemon zest of two lemons, juice of two lemons, garlic cloves, olive oil, oregano, paprika, salt, and pepper. Throw the chicken into a large ziplock bag and toss the marinade with the chicken, BUT SAVE a fourth of the marinade for the salsa. 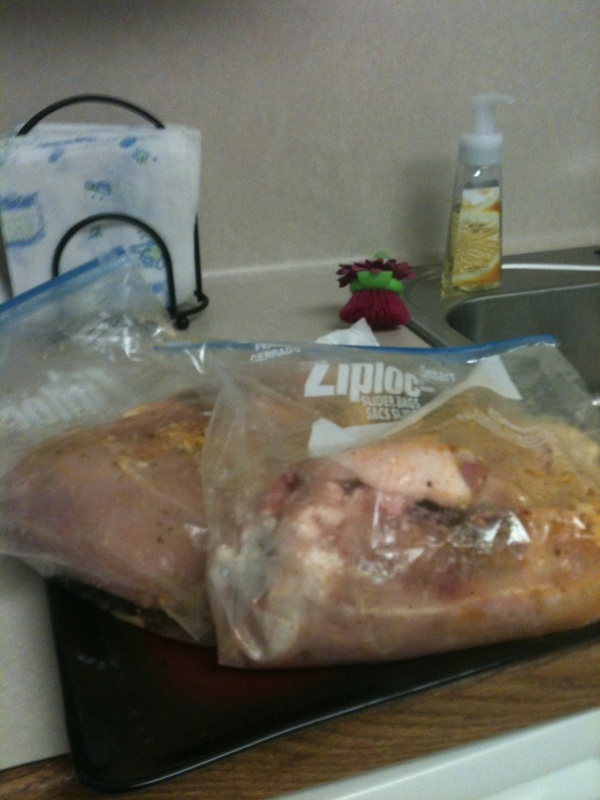 Place on a plate (to prohibit drippings in the fridge) and allow to sit in fridge for two-four hours. Or even over night if you can remember that far ahead. 2. Make cucumber salsa. 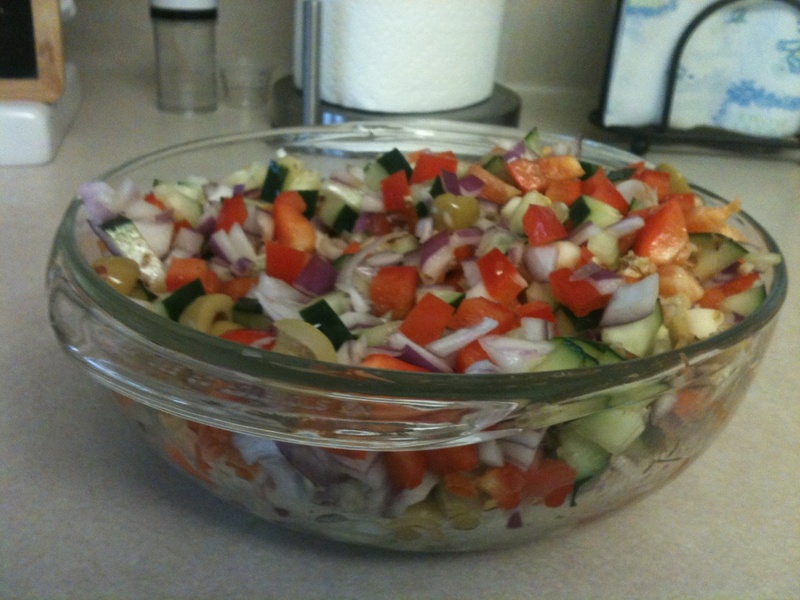 Chop up the cucumber, onion, olives, and bell pepper and add in a bowl with the leftover marinade. Place in the refrigerator until time to eat. 3. 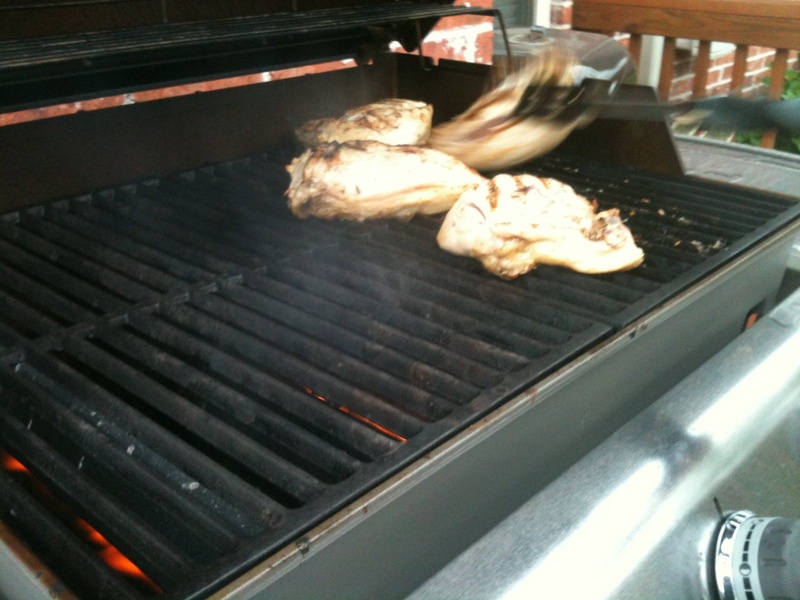 Cook chicken on grill. Do not cook directly over the flame, and allow 45-50 minutes cooking time. Use a meat thermometer to determine when the chicken is ready. When the thickest part of the chicken reaches 180 degrees F it is ready. Serve with salsa. 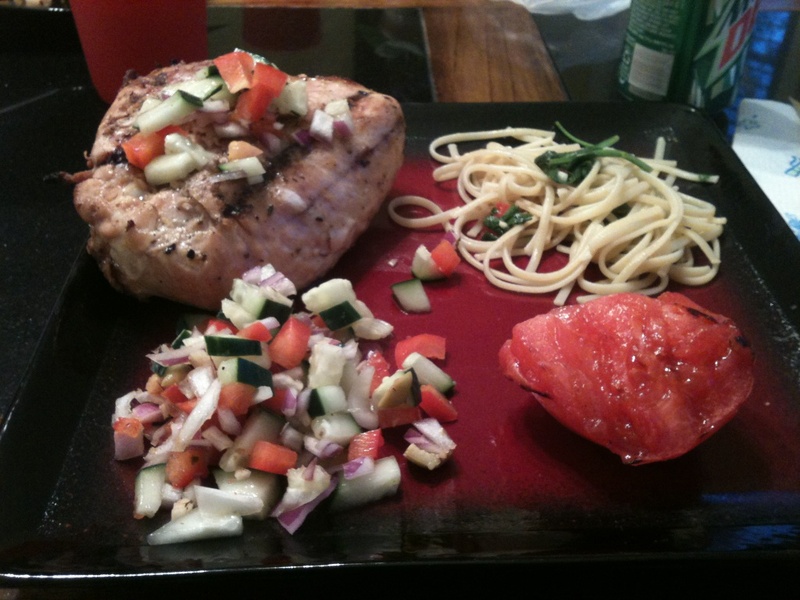 Along with this my father grilled some tomatoes (he is a tomato-holic). 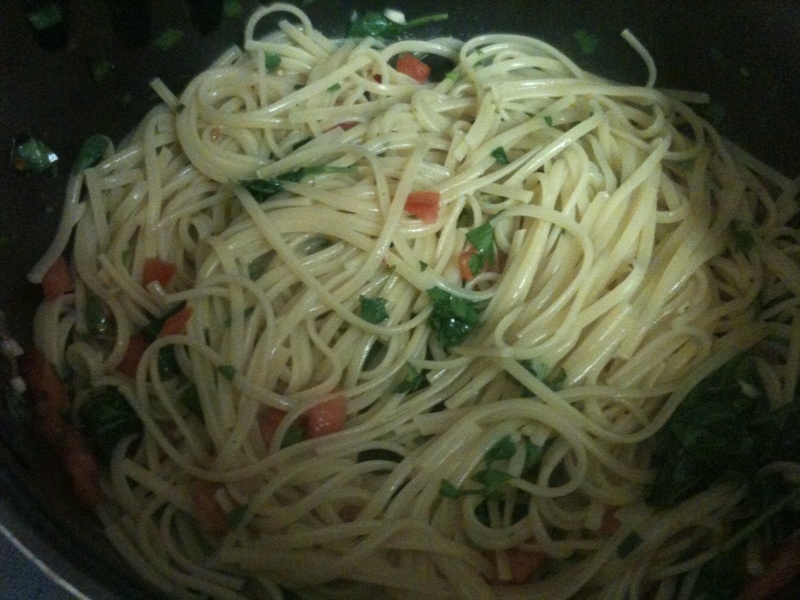 I also prepared my favorite noodles to go along with this. 1. Cook noodles as directed on package. 2. 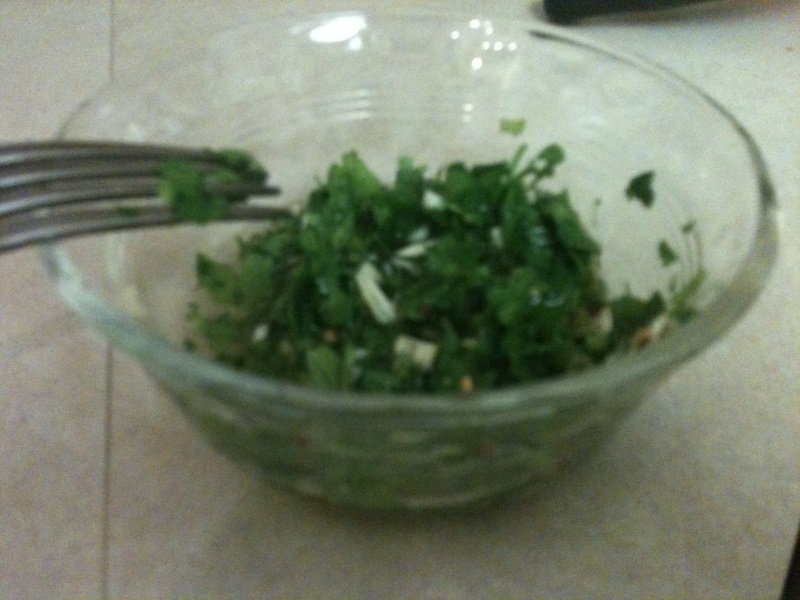 Finely chop garlic and add it to a small bowl with the parsley, crushed red peppers, vinegar, and melted butter. 3. When noodles are done cooking, drain and return to bowl. Mix together the vinegar mixture, tomatoes, and noodles.